I know there are many pasta purists out there, and you might be one of them. Even if you are, I hope you’ll still give this Swap-out Sunday a try: it’s an easy step towards eating foods that are closer to their natural state. And it doesn’t take any extra effort in the kitchen. 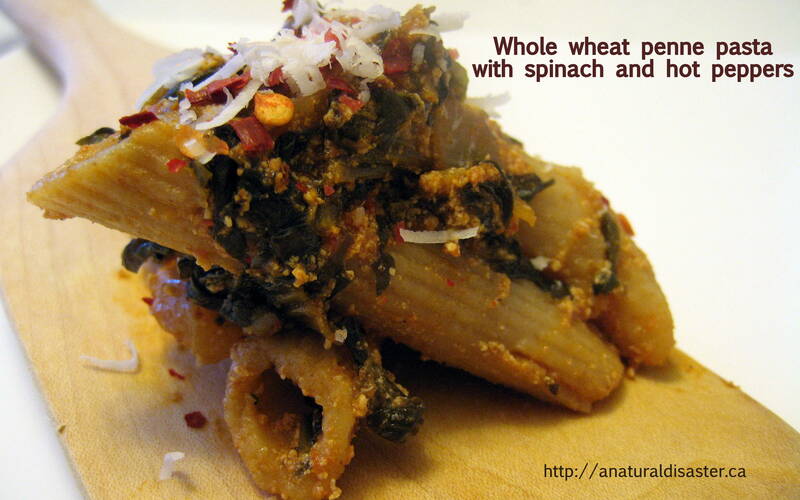 This week, swap out regular boxed white pasta for a whole wheat variety. I’m not asking you to make it from scratch; dried pasta has very few ingredients anyway. White pasta is basically durum semolina flour (a hardy type of flour that holds up well to stretching and boiling), water, and the vitamins that must be legally added back in because they were stripped out of the flour when it was processed from whole wheat to white. 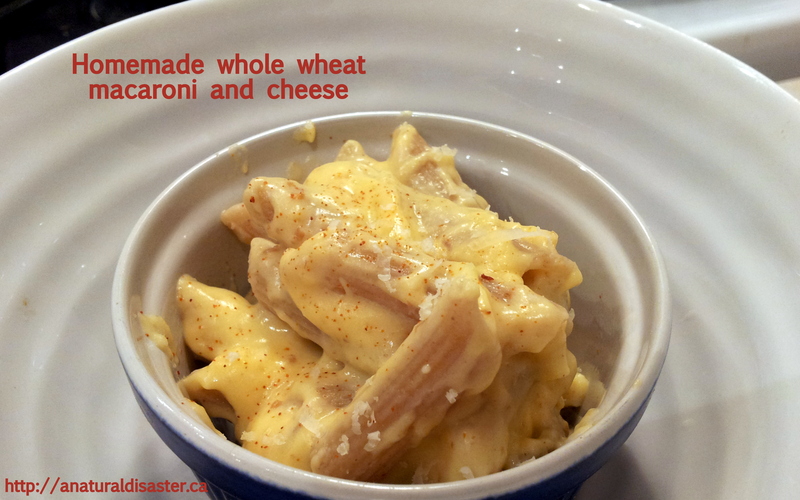 Whole wheat pasta is just whole grain wheat durum semolina flour and water (don’t bother with add-ins like vegetables – there’s not enough room to squeeze in a worthwhile amount anyway). Inexplicably, I have seen brands (including Catelli Healthy Harvest, purveyors of the widest variety of whole wheat pasta shapes, fortify their whole wheat pasta with additional vitamins. This is not required by law (and not needed if the pasta is whole grain), so look for a brand like President’s Choice that doesn’t have them. As for taste, I personally find there’s not much difference between white and whole wheat pasta. Whole wheat has a meatier texture perhaps; it’s not as silky. If you’re worried about the difference, try it with a flavourful sauce or in a dish full of veggies and cheese like lasagna. Keep in mind whole wheat pasta will take a few minutes more to cook than white. Mike has made whole wheat pasta from scratch in the past. It worked, but it was more trouble than it was worth. 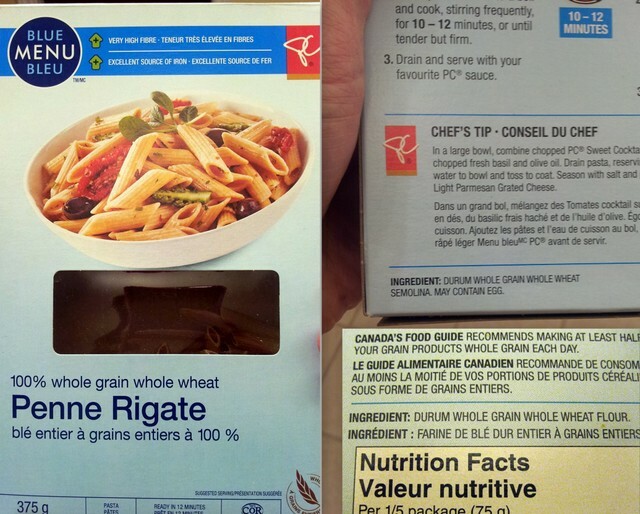 Boxed pasta that is whole-grain and doesn’t contain funky non-food ingredients is a definitely a “processed” food I can live with, and I hope you can too.